2013 A Retrospective & 2014 Whats in Store? This will be my last blog post for 2013 and as has become traditional I like to reflect back on the year that was and also look forward to what is in store for the coming year. 2013 was my busiest year ever in terms of sheer miles travelled. I have no idea how many miles I covered in total, how many aeroplanes I boarded, how many times I went through airport security or how many tens of hours I spent waiting around in airports for connecting flights, but it was a lot – an awful lot. There have been moments during lengthy airport layovers when I have questioned the wisdom of choosing polar photography as a speciality (especially since I live in Australia). The flip side being I have such a love and passion of photography in the Polar regions that I could not ever imagine doing anything else. Airport layovers are therefore nothing more than an unfortunate means to a much loved end. 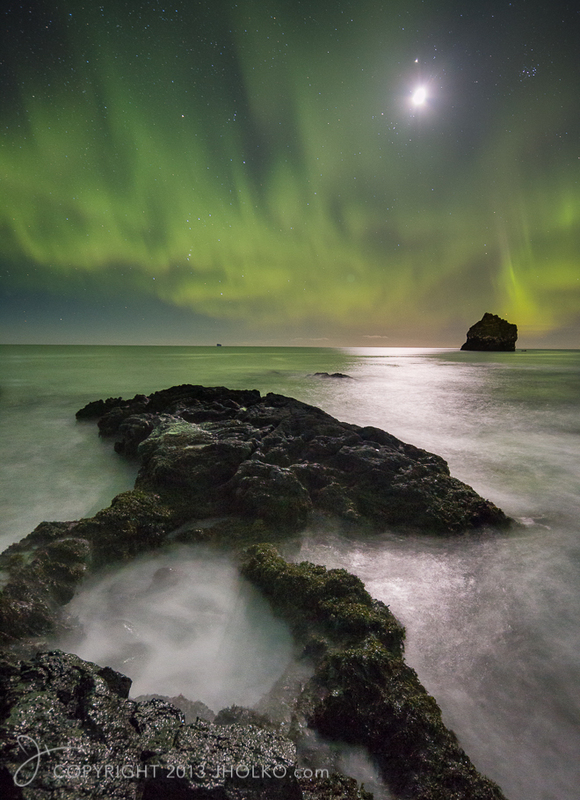 2013 began in earnest for me back in in March when I lead back-to-back workshops to Iceland in with my good friends Andy Biggs and Daniel Bergmann. These were brilliant trips with a real mix of traditional Icelandic weather and light. We were fortunate to experience more than a few days of Aurora Borealis during the first workshop that made for some stellar (pardon the pun) photography. Iceland is an incredible country in winter; snow blankets the land, the waterfalls partially freeze, and the normally colourful land takes on a more monochromatic pallet. Whilst the weather can be brutal in winter the rewards for those willing to brave the elements can be equally amazing. After Iceland I travelled to the remote north west of China and the Gobi desert in April with my good friend Antony Watson on a scouting trip for a possible future workshop to this area. At our most northerly point we were only around 60 kilometres from the Russian and Kazakstan borders and we did encounter some incredible landscape and had some memorable experiences. Logistically this was my most challenging trip of the year and I wrote quite extensively on my experiences in China on my return (Read the Report). There are only a few places in the world I have travelled that I have no desire to return. China is perhaps unfortunately at the very top of that list with its and utter contempt for its environment and horrendous industrial pollution. In July I travelled back to Iceland and guided a highly successful Summer Workshop with Daniel Bergmann before heading to the Arctic to photograph Polar Bears. 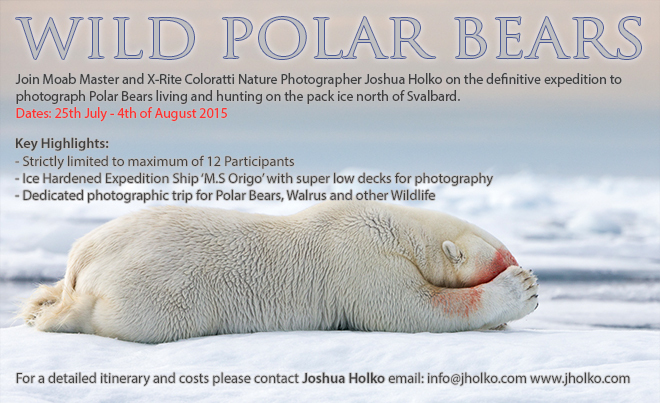 This expedition to photograph Polar Bears was one of the real highlights of the year for me personally and I will soon be announcing a new trip that will return to the permanent pack ice north of Svalbard in late July 2015 to photograph Polar Bears. 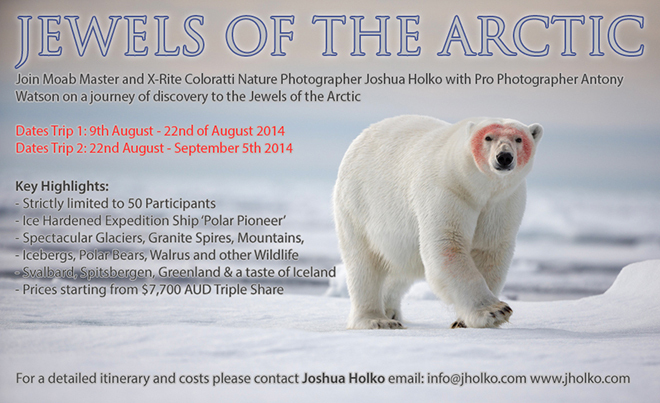 This expedition will be limited to just twelve photographers and is sure to be a once in a lifetime experience. With the arctic sea ice shrinking fast and the number of Polar Bears dwindling the number of years left to photograph these incredible animals is unfortunately very limited. I will have more to say about this new expedition here on my blog early next year. For now, here is a brief teaser. On returning to Longyearbyen I then lead two back-to-back expeditions to Svalbard and Greenland (Read the Report). We explored many of the fjords in Greenland and encountered everything from Arctic Hare, Blue and Fin Whales, Bearded Seals to Polar Bear and Musk Ox. We also saw and photographed some amazing icebergs. During my time in the Arctic I also produced a short film in conjunction with Untitled Film Works on what it was like to travel on a dedicated photographic expedition. Our travels around Svalbard and Greenland yielded us some incredible footage and I am very pleased with the video we produced. Be sure to click on the image below to watch in High Definition. In November I travelled to Antarctica (Read the Report) to lead an expedition with Daniel Begmann to the great white continent. Antarctica is a miraculous place – a continent of stark and beautiful desolation and I never tire of returning to this incredible continent. It is the closest experience I think most of us will ever get to travelling to another planet. On this expedition we had some stunning light including a passage through the Lemaire Channel that was unforgettable. Reflecting on the year that just passed this single day of photography was probably the stand out highlight for me personally (as many others who were aboard have also indicated). I have already seen some incredible photography emerge from many of the participants on this expedition and I am looking forward to some in depth image reviews with those participants who are travelling with me again in 2014. After Antarctica my friend Martyn, Daniel and I journeyed to the Chile side of Patagonia where we spent a week exploring the park by hire car. Our time in Patagonia was somewhat hampered by the relentless wind that Patagonia is notorious for delivering and an unfortunate lack of dramatic light. 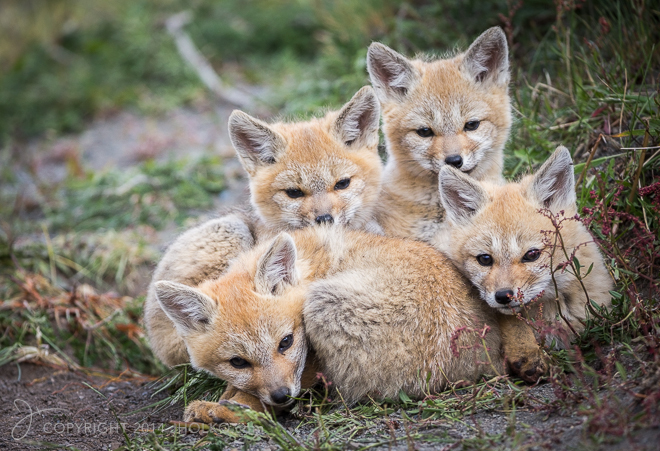 The highlight of our trip to this part of Patagonia was stumbling across a den of Patagonian Grey Fox cubs, which we spent several hours photographing. We also hiked up to the base of the Towers of Pain – A rather arduous sustained steep hike of approximately twenty kilometres. On the whole I found Patagonia spectacular in terms of scenery, but quite a challenging location to photograph. Had we experienced more dramatic light with less wind I would likely have a different impression. 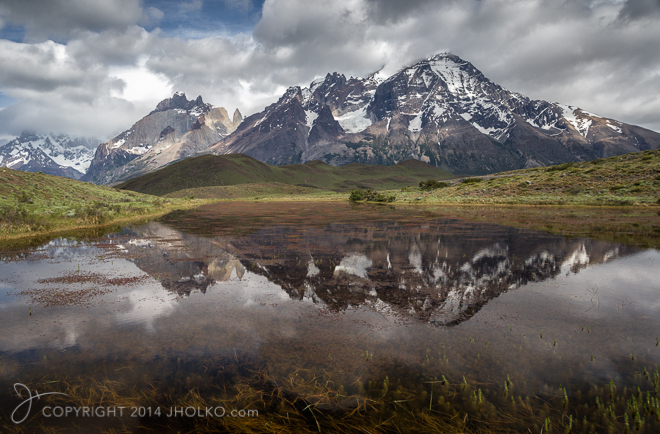 I hope to return to Patagonia on the Argentinian side late in 2014 and have my fingers crossed for better light. 2014 kicks off for me in just a couple of weeks in mid January when I will travel to the South Island of New Zealand to complete a week long assignment in Kaikoura. This was a project I was supposed to complete late 2013 before I travelled to Antarctica and Patagonia but I succumbed to pneumonia and instead spent the better part of a month recovering. After this assignment I will return home for a short time before I fly back to the South Island to guide a two week long photography expedition. The itinerary we have planned for this trip is very exciting and I am very much looking forward to our time in the South Island. On this workshop we are looking forward to a privately chartered helicopter flight over the alps with the doors removed for photography as well as a private charter to photograph Dusky Dolphins. We will also be circumnavigating the island and visiting many of its wondrous locations. To those of you who have enquired about joining this trip in the last month I apologise but it is completely sold out. 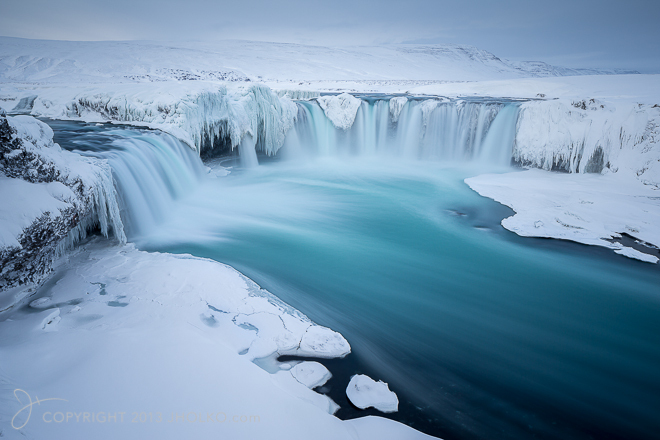 In March I will be leading my annual Iceland winter workshop with Daniel Bergmann. We have a new itinerary for 2014 that takes us into the North to some of the more remote locations accessible in winter. I always look forward to returning to Iceland in winter. Although my favourite place in Iceland (the Highlands) is all but inaccessible during the winter months there is a starkness and harshness to the coastal environment that is extremely appealing and incredibly photogenic. This 2014 workshop is sold out, but I will soon be announcing dates for 2015 for those of you who wish to book early to avoid missing out. After we complete our March workshop I am going to stay on in Iceland for another week in the north where I intend to spend my time looking for and photographing Arctic foxes for a long term project I am working on. 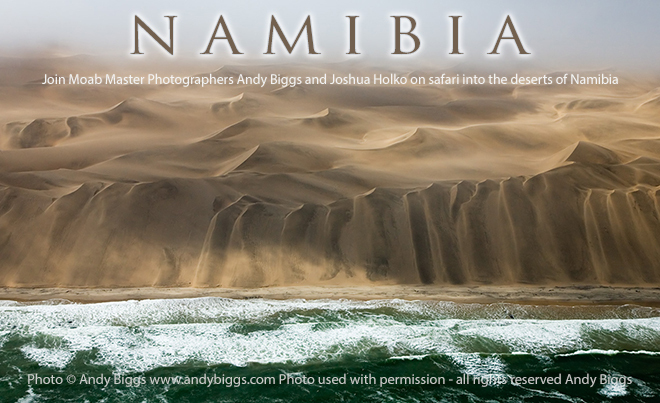 I am then going to abandon the winter expedition clothing and fly directly to Africa to lead to back-to-back workshops in Namibia with Andy Biggs. Namibia is a long time dream of mine and it should be very interesting experience to go from the Arctic winter of Iceland to the oldest desert dunes in the world. Our Namibia safari is overland so we will be travelling in four wheel drives between our planned shooting locations. Travelling by land between locations gives us a lot of flexibility in terms of when we can stop. It also allows us to avoid the limiting weight restrictions of light planes and bring everything we need. The second workshop is sold out but there is still one place remaining on the first trip if you are interested in joining us. In July I will head back to Iceland for back-to-back summer workshops with Daniel Bergmann that will see us circumnavigating the island. Summer is my favourite time to visit Iceland with access to Landmannalaugar and the spectacular highland regions. The first trip is sold out but there are still two places remaining on the second trip if you would like to join us. 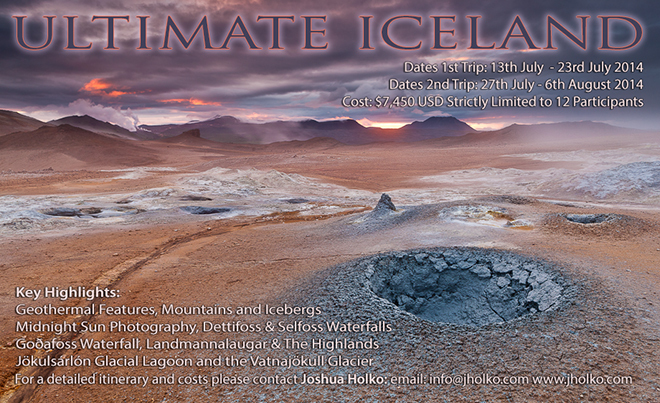 This new itinerary for 2014 sees us circumnavigating the island and visiting many of Iceland’s landscape treasures. From Iceland I am travelling further north to Longyearbyen to lead two expeditions to Svalbard and Greenland with my friend Antony Watson. These expeditions ‘The Jewels of the Arctic‘ take in the best of Svalbard and Greenland. These ship based expeditions to the Arctic are the best way to see and photograph the incredible landscape and geology found in this part of the world. Travelling by ship in the Arctic is not without its challenges but the ability to navigate the many fjords and explore the wild coastlines of this region make the sea days worth the effort. On return to Australia I will have some downtime before I head back to Ushuaia in South America for a once in a lifetime expedition to South Georgia Island and Antarctica with Andy Biggs. This twenty one day expedition promises to have both incredible wildlife and landscape opportunities. Although I have been to Antarctica multiple times I have not as yet visited South Georgia Island and this is an experience I am very much looking forward to. We are close to sold out now on this expedition so if you are interested in joining please contact either myself or Andy. On return to Ushuaia I will have just over a week of free time when I hope to explore the Argentinian side of Patagonia – this time with dramatic light! I will then lead one last expedition for the year to the Antarctic Peninsula with my friend Antony Watson. It is going to be a big year for airline miles (even bigger than 2013) and I am looking forward to getting underway. To those of you with whom I was fortunate to travel with this year I want to say thank you for sharing the adventure and making it a memorable year. To those of you with whom I am looking forward to travelling with in 2014 I look forward to sharing in some incredible experiences. I also want to say thank you to my readers and those of you who follow my photography and blog – thank you. Over the course of the year I published my favourite twelve photographs here on my blog. Please be sure to check them out and let me know what you think. 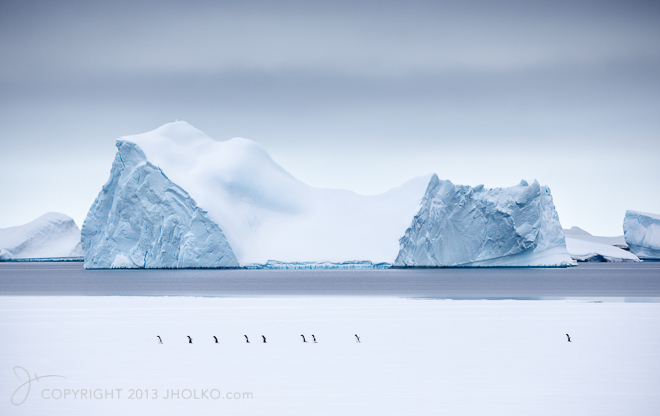 It is always hard to pick an overall favourite but I think this year I have clear personal favourite and it is is this photograph from Antarctica of Gentoo Penguins marching across the sea ice in front of giant icebergs under soft polar light. Lastly, I want to wish all of you a very safe and happy New Year and may 2014 be one of amazing light and experiences for all of you.